If you’re like us and love staying in nice hotels and vacation homes, why not make your own home feel like one? It’s easier than you think when you have a Design + Build firm to manage your home remodel from conception to completion. Part of the reason vacationing feels so glamorous is that you get to stay in a new and exciting place. Everything is open, airy and fresh. Why not create your own oasis to come back to everyday? Don’t let these projects slip away. There are several reasons to remodel your bathroom. This is typically where you start and end your day. You want to make sure your day is off to a good start and you want to have somewhere relaxing to soak in your evening. Create a spa retreat in your own home with HDR Remodeling. When a house has been lived in for a while, and the bathroom has been in use, it is quite common for features like broken or loose tiles, leaking showers and tub valves or bad plumbing to exist. To prevent issues and frustrations in the long term, remodel your bathroom to fix these issues. An updated bathroom dramatically increases the look and feel of the home and can remind you to pamper yourself everyday. There are times when you just need a change of design to get into a better frame of mind. At such times, remodeling the kitchen in your home is a great idea. A kitchen remodel can make cooking feel fun, and can encourage you to make healthier choices. After a while, a used kitchen begins to deteriorate. Sinks begin to clog, build up from years of use occur, and outdated appliances makes it easier to just eat out. These things need to be fixed to ensure the kitchen is an enticing and enjoyable place to gather around. As much as cooking is an essential part of home living, it can also be a form of art and can teleport you from where you are, to where you want to be. Food gives you a taste of other cultures and cities and the best way to create this, is to make your kitchen an inviting place to cook. If like some, your resolution is to eat right and remain healthy, your kitchen is the best place to start. Remodel your kitchen to ensure that every visit to the kitchen gives you inspiration and awesome thrills. 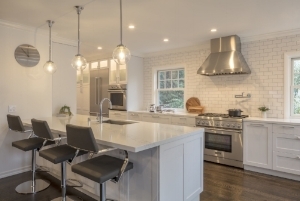 Things like increasing the market value your home and a desire for change are also valid reasons for remodeling your kitchen. But whatever your reasons for remodeling may be, you can rely on HDR Remodeling to help you achieve your dream home. Give your home a facelift by updating your kitchen and bathroom.